The term “Ripasso” sounds like and in fact means “repassed.” That refers to its production process whereby regular, fermented Valpolicella is added to a cask containing the skins and lees left over from fermented Amarone wines. The end result is a wine called Ripasso that retains the vibrancy of Valpolicella but is darker in color, bigger and more flavorful and complex than the original Valpolicella. It’s a wine with sufficient stuffing to go with hearty foods such as stews, braised red meats, game and aged cheeses. 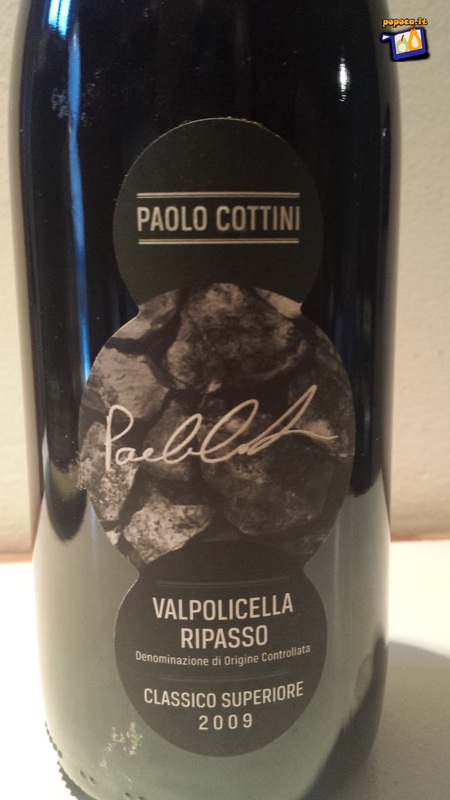 In 2009, Ripasso della Valpolicella received its own DOC designation, and this version of Cottini is the best one. Enjoy it! BUY NOW , CLICK HERE!!! Wash the mushrooms, dry them and put them in a blender (food processor, mixer, what you have) with salt, pepper and boiled chestnuts: mix until you obtain a semi-liquid compound, and then pour it the pan. You can help yourself with a spoon. Cook until all the water contained in mushrooms dries off, for about 10 minutes (depending on the heat of the pan, taste it before removing from the stove!). Heat a frypan on high heat and add a little olive oil. Season the beef and sear in the hot pan for 30 seconds on all sides. Remove beef from pan and set aside to cool. When cool, spread the mustard over the beef on all sides. Proceed now to the preparation of beef Wellington: lay a sheet of cling film on a bench top and arrange the prosciutto on it in slightly overlapping rows. Spread the mushroom paste evenly over the ham, then place the beef fillet in the middle. Keeping a tight hold of the cling film from the edge, neatly roll the prosciutto and mushrooms around the beef to form a tight barrel shape. Twist the ends of the cling film to secure, then chill for 15-20 minutes to allow the beef to set and keep its shape. Place the puff pastry on a floured surface (I use the plastic backing of the pastry sheet). Remove the cling wrap from the beef then lay it in the centre. Fold the ends over, then wrap the pastry around the beef, trimming any excess. Turn over so the seam is underneath and place on a baking sheet. Brush the pastry all over with egg yolk and chill for about 15 minutes to let the pastry rest. (The dish can be prepared to this stage and held over until you are ready to cook – just bring it back to room temp beforehand). Heat the oven to 200 deg Celsius. Lightly score the pastry at 1cm intervals and glaze again with egg yolk. Bake for 20 minutes at 200 deg, then lower the temp to 180 deg and cook for a further 15 minutes. Allow to rest for 10-15 minutes wrapped in foil before carving. The beef should still be pink in the centre (med rare) when you serve it. Because it is such a flavoursome dish I generally serve it with pretty simple baked or smashed spuds and steamed vegies. I took these photo’s whilst preparing for a dinner party, so was doing two servings.